Why should any of this be easy? Predicting the future is a slippery slope into certain madness. Weather models are usually wrong. The trick/art is to latch on to the models that are wrong a little less often. Thanks for letting me get that out of my system. Every storm is different and uniquely maddening - weather forecasting a generally unwinnable game of 3-D chess. Speaking of three dimensions, we rely on weather balloons to track upper air temperature, wind and moisture. A surge of milder air aloft could trigger an rainy/icy mix from the Twin Cities into southern Minnesota this afternoon. If we do pick up a few hours of liquid precipitation, that will keep metro snow totals down a bit; maybe closer to 5-8 inches (total new snow) by Sunday. There's a better chance of 10" west of MSP, with a foot or more possible over far western Minnesota. That's plenty, thank you very much. Another storm the middle of next week brings mostly-rain. There's a sign of spring! Expect highs in the 30s with nights colder than freezing, which may put a brake on snow melt. I'm worried about spring flooding. Photo above: note the Florida plates. Couldn't resist. Sorry. Significant Ice Storm for Southwest Minnesota? 00z 3 KM NAM guidance suggests some .25 to .50" accumulations of glaze ice over southwestern Minnesota today - much ligher amounts of freezing rain for the metro area. Travel from Windom and Granite Falls to Marshall, Worthington and Fairmount may be extra-treacherous. Map: pivotalweather.com. 3KM NAM-WRF Model Snowfall Prediction. This is from last night's 00z run, printing out about 6" of snow for the metro, but a little more north metro, with the heaviest (10"+) amounts piling up over far western Minnesota, deeper into the cold air. I still expect a few hours of rain or freezing rain this afternoon from the MSP metro on south to Albert Lea and Rochester. 12KM NAM Guidance (Updated). Here is the 12z Saturday run output, showing 4-7" across most of the metro, with over a foot for parts of far west central Minnesota. European Solution (Updated). The 12z Saturday ECMWF solution indicates closer to 6-7" for the Twin Cities, with over 10" predicted for parts of central and western Minnesota. Place your bets. Map: WeatherBell. A strong area of low pressure across the central United States this weekend will lead to the potential of heavy snow and severe storms. Snow is already falling across parts of the Northern Plains and upper Midwest this morning, and will continue to spread into the western Great Lakes today. Snow will be heavy at times, with 1-2” per hour snowfall rates possible. This will lead to widespread snow totals of 6”+ from the Dakotas into Wisconsin, and the potential of up to a foot or more in western Minnesota. This snow - along with strong wind gusts leading to blowing and drifting snow - will make travel difficult across the region. Severe storms continue to be possible today, especially from southern Illinois into parts of Dixie Alley where an Enhanced Risk of severe weather is in place. Tornadoes (some potentially strong), damaging winds, and large hail will be possible later today. Morning Radar. Snow is falling this morning across parts of the Northern Plains into western Minnesota, and some freezing rain has been reported in the Sioux Falls area. 6" of snow had been reported in Bowman, ND, with snow totals up to 4.5" so far in Bismarck, ND and up to 2.4” so far in Aberdeen, SD. Winter Storm Overview. Wintry precipitation will continue to spread across the upper Midwest today. At the start of the wintry precipitation for places like the Twin Cities a period of mixed precipitation or freezing drizzle is possible before changing to all snow. Snowfall rates of 1-2” per hour will lead to snowfall totals of over a half a foot from the Dakotas into Wisconsin, and road crews will likely have a hard time keeping up with this heavy snow. This means that travel conditions are likely to become difficult quickly as this snow falls. Snow will start to taper off across the upper Midwest Sunday as the area of low pressure continues to move out of the region. Winds will also pick up across the region today into Sunday, leading to low visibility due to blowing and drifting snow. Rapid City, SD: Winter Weather Advisory through 5 PM for an additional inch of snow and wind gusts up to 45 mph. Bismarck, ND: Winter Storm Warning through 7 AM Sunday for 6-8" of snow. Fargo, ND: Winter Storm Warning through 1 PM Sunday for 6-12" of snow and wind gusts up to 35 mph. Sioux Falls, SD: Winter Weather Advisory through 7 AM Sunday for 2-4” of snow, ice accumulations up to two-tenths of an inch, and wind gusts as high as 45 mph. Minneapolis, MN: Winter Storm Warning from Noon Saturday to 7 AM Sunday for 6-10" of snow, a glaze of ice, and wind gusts as high as 35 mph. Duluth, MN: Winter Storm Warning from 3 PM Saturday to 10 AM Sunday for 6-8" of snow. Rochester, MN: Winter Weather Advisory from 9 AM Saturday to 7 AM Sunday for 2-4” of snow, up to a tenth of an inch of ice, and wind gusts as high as 35 mph. Green Bay, WI: Winter Weather Advisory from 6 PM tonight to 10 AM Sunday for 2-5” of snow, less than a tenth of an inch of ice, and wind gusts up to 35 mph. Marquette, MI: Winter Weather Advisory from 9 PM tonight to 5 PM Sunday for 3-6” of snow and wind gusts up to 35 mph. Alpena, MI: Winter Weather Advisory from 7 PM tonight to 1 AM Sunday for up to 2” of snow. Additional Snow Totals. The heaviest snow today into Sunday will fall from parts of the Dakotas into Minnesota and Wisconsin, where an additional 6”+ could fall. The heaviest totals are expected in parts of western Minnesota which is where some areas could see a foot or more of snow, including areas like Alexandria and Bemidji. While snow totals of 5-10” are expected around the Twin Cities, those totals will be impacted by a period of mixed precipitation at the beginning of the event - depending on how long that lasts before the changeover to snow occurs will determine how much snow will fall overall. Ice Potential. This system will also bring the potential of some ice across the upper Midwest, with most areas seeing a tenth of an inch or less. The greatest ice potential will be around the Sioux Falls (SD) area, as well as in central Michigan, where up to two-tenths of an inch is possible. Strong Winds Expected. Strong wind gusts of 30-45 mph are expected to accompany this system today into Sunday. This will lead to areas of blowing and drifting snow across the region not only while the snow is falling but after the snow has ended, which could continue to impact travel. Severe Storms This Morning. This system is also producing severe weather in the southern United States. Already this morning strong storms are occurring from Missouri into Texas, with Severe Thunderstorm Watches in place. The watch runs until 11 AM for areas like Fort Smith (AR) and Dallas (TX), until 10 AM for areas north of Fort Smith (AR), and until 3 PM for areas like Little Rock and Texarkana (AR) and Shreveport (LA). Earlier this morning hail of 1-1.25” in diameter had been reported across parts of the northern DFW metroplex. Enhanced Severe Threat Today. The severe threat will continue today, mainly further east from where storms are occurring this morning. Storms later today, especially from southern Illinois into northern Mississippi, will be capable of tornadoes (some of which could be strong), damaging winds, and large hail. Due to the severe weather risk, an Enhanced Risk of severe weather is in place, including cities like Memphis (TN), Clarksville and Jackson (TN). Limping Into Spring. A good thing we're not fast-forwarding into spring, with all the snow on the ground, a deep (2-4 foot) frost layer and soil moisture in the 99th percentile (still wet from last fall). Highs generally above freezing will mean snow melt by day, but sub-freezing nighttime lows will act as a brake, slowing melt during the overnight hours. Rain predicted for the middle of next week will accelerate snow melt for a few days, though. ECMWF: WeatherBell. U.S. Just Sloshed Through the Wettest Winter on Record. No kidding. AP has details: "Federal meteorologists say this winter was America’s wettest on record. 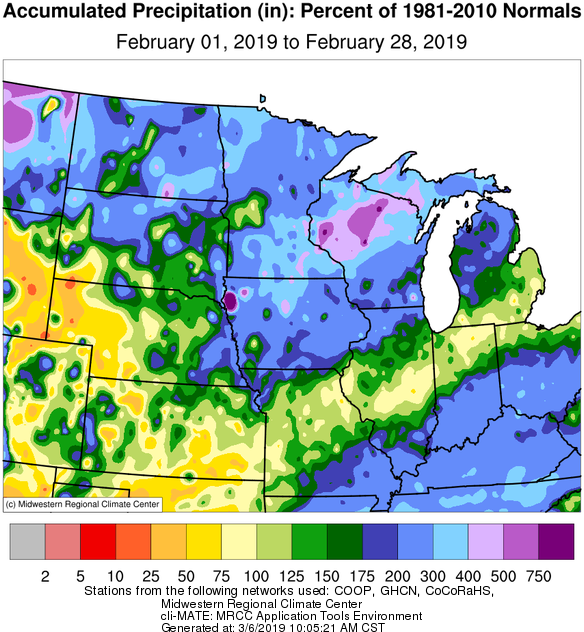 The National Oceanic and Atmospheric Administration says that from December to February, what it calls winter, the Lower 48 states got 9.01 inches of rain and snow, which is 2.22 inches more than the 20th century normal. It surpassed the 1997-1998 winter by 0.02 inches. Record or almost record rain and snow fell in the West, Tennessee Valley and parts of the Great Lakes. Last month was the second wettest February on record..."
File photo credit: "In this Wednesday, Feb. 27, 2019 file photo, a man uses a paddle board to make his way through the flooded Barlow Market District in Sebastopol, Calif. On Wednesday, March 6, 2019, the National Oceanic and Atmospheric Administration said that from December 2018 to February 2019 the Lower 48 states got 9.01 inches (22.89 centimeters) of rain and snow, which is 2.22 inches more than the 20th century normal." (AP Photo/Eric Risberg). "Above Normal" Risk of Spring River Flooding. Those words courtesy of NOAA's North Central River Forecast Center. More details: "There continues to be an above to much above normal chance of widespread flooding in the Upper Mississippi River basin including its headwater tributaries. Overall, the chance of flood risk throughout the remainder of the basins within the NCRFC area is normal to above normal. Above normal precipitation and below normal temperatures have continued since our initial Spring Flood Outlook. Precipitation in February was 200 to 400 percent of normal with northcentral Wisconsin over 400 percent of normal. Soil moisture ranking from the Climate Prediction Center continues to show mostly above normal conditions across the NCRFC area. These very wet soil conditions have continued to produce normal to above normal streamflows across much of the region this early spring. As we have continued to receive above normal precipitation throughout late winter and early spring, the U.S. Drought Monitor continues to show no drought conditions in our region. Deep frost continues throughout the area as a result of the continuation of well below normal cold temperatures. With above normal snowfall in February and the beginning of March, combined with the forecast of continued cold temperatures and additional precipitation, at least in the next couple weeks, the elevated flood risk trend continues. Again, depending on Spring precipitation and temperatures in the coming months, we may see a rapid melt of the snowpack, leading to widespread flooding..."
Map above courtesy of NOAA. Alabama's Deadly Tornado Ripped Through Homes - and Exposed Vulnerabilities. Here's a clip from The Washington Post: "...Bobby Kilgore, a police captain in nearby Opelika, said officials are grappling with how to get weather-weary citizens to seek shelter when a watch is issued even if experience has taught them that there is a very low chance of being hit. “Once the siren goes off, it is already too late,” he said. It can be very dangerous to travel to a public shelter in the few minutes before a tornado hits. “You don’t want people getting in their car and driving,” van de Lindt said. Lee County has been aggressive in pushing out information via social media, weather radios and television, Myers said. But the fact that the storm came on a Sunday probably hampered preparedness, with people’s routines and communications different than during the week..."
1883: The massive eruption of Krakatoa sends high-altitude dust clouds swirling around the Earth. 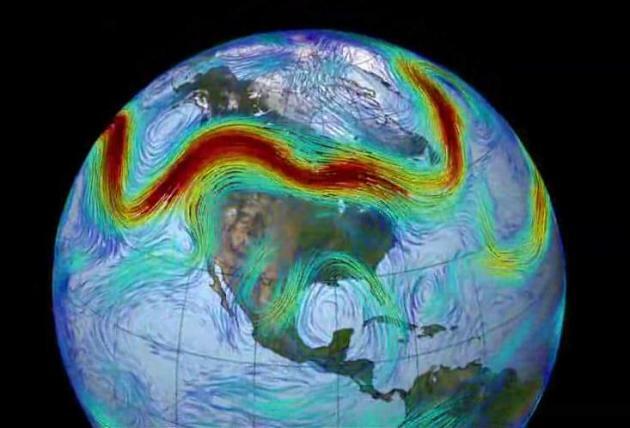 Astute weather-watchers note that an “equatorial smoke stream” seems to circulate debris around the globe. 1934: American test pilot Willie Post sets an unofficial altitude record flying at 50,000 feet, stumbling upon the jet stream in the process. 1939: German meteorologist Heinrich Seilkopf coins the term “Strahlströmung” (literally “jet streaming”) to describe the phenomenon. 1944: American meteorologists realize the jet stream exists after headwinds frustrate bombers on their way to Japan. A Privacy-Focused Vision For Social Networking. Here's an excerpt of a long post from Facebook founder Mark Zuckerberg: "...But now, with all the ways people also want to interact privately, there's also an opportunity to build a simpler platform that's focused on privacy first. I understand that many people don't think Facebook can or would even want to build this kind of privacy-focused platform -- because frankly we don't currently have a strong reputation for building privacy protective services, and we've historically focused on tools for more open sharing. But we've repeatedly shown that we can evolve to build the services that people really want, including in private messaging and stories. I believe the future of communication will increasingly shift to private, encrypted services where people can be confident what they say to each other stays secure and their messages and content won't stick around forever. This is the future I hope we will help bring about..."
18" snow on the ground at MSP Friday morning. 33 F. maximum temperature in the Twin Cities on Friday. 37 F. average high on March 8. 31 F. high on March 8, 2018. Capitalism vs. Climate Change: The Case of GlassPoint Solar. A very interesting new way to leverage solar power, highlighted in a post at Forbes: "...However, there is another solar technology that is more direct and powerful: Concentrated Solar Power (CSP). CSP arrays do not absorb light but reflect it, concentrating a sliver of the sun’s energy onto a single focal point. A pipe placed at that focal point contains some material which heats up as the reflected light hits it. That heat energy can either be stored for later (in which case, molten salt is the material of choice) or can be used to do work (in which case, the pipe is filled with water that turns to steam). GlassPoint Solar has spent the past several years developing a unique approach to CSP that generates steam for oil companies engaged in Enhanced Oil Recovery (EOR) – the process of forcing heavy oil out of difficult-to-extract formations..."
Image credit: "Crescent Dunes Solar Energy Installation, situated in Nevada, uses its CSP array to heat molten salt flowing in the tower at the center of the array. Heat energy is stored in the molten salt and can be used to power steam generators." Wikipedia. It Really Shouldn't Be Raining on the Greenland Ice Sheet in Winter. That's a fair assumption, yes. A story at Quartz explains what's causing concern among scientists: "...Rapidly warming winters have brought about a bizarre phenomenon: Rain. On Greenland. In winter. Rain, quite simply, melts ice. In a paper published Thursday (March 7), researchers at Germany’s GEOMAR Centre for Ocean Research and the Columbia University Earth Institute compiled satellite data and on-the-ground observations to learn that Greenland ice melt triggered by winter rain tripled between 1979 and 2012. Melt from rainfall during summer doubled in that time frame. 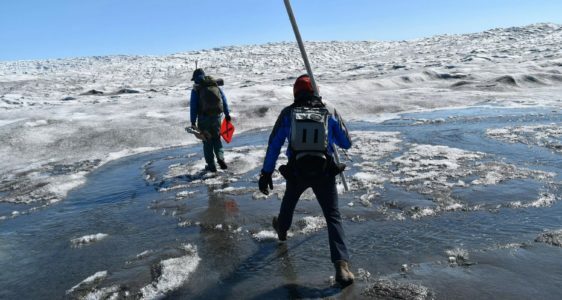 Researchers believe the Greenland ice sheet is losing around 270 billion tons of ice per year, a rate of loss likely greater than it has seen in 8,000 years or more..."
Photo credit: "Ice melt from winter rainfall in Greenland tripled from 1979 to 2012." Kevin Krajick/Earth Institute. How Climate Change is Fueling Extremism. A post at CNN.com caught my eye: "Climate change is already triggering devastating weather events across the planet, including prolonged droughts, flash floods and wildfires. Parts of Africa and the Middle East are experiencing erratic harvests, heavy storms and the worst drought in the past 900 years. Experts say that people here who are struggling to provide for their families are vulnerable to the influence of extremist recruits who offer them work and food...The Middle East and North Africa (MENA) is the world's most water scarce region. MENA is home to six percent of the world's population, but only one percent of the world's freshwater resources, according to the World Bank. 17 countries in the region fall below the water poverty line set by the United Nations, and some experts believe that drought played a part in sparking Syria's civil war..."
Photo credit: "An Iraqi boy walks through a dried up irrigation dyke in the village of Sayyed Dakhil, some 300 kilometres (180 miles) south of Baghdad, on March 20, 2018. Drought is threatening agriculture and livelihoods in the area." Markets Aren't Buying Denial on Climate Change. Bloomberg explains: "...This agreement between markets and models is important, because it means that investors either believe what the models say, or rely on other data to draw the same conclusion. By refusing to bet that recent warm years were an anomaly that will revert to the mean, market participants are basically ignoring conservative claims that climate scientists have misled the public to exaggerate the threat of warming. When forced to bet, investors bet on warming. 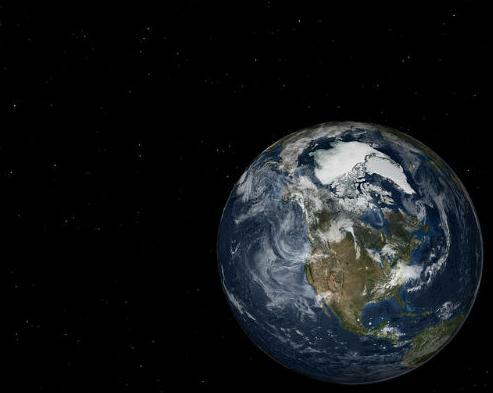 But this doesn’t necessarily mean that markets believe that the impact of climate change will be as severe as many predict..."
School Lessens Targeted by Climate Change Doubters. Here's the intro to a story from The Associated Press: "A Connecticut lawmaker wants to strike climate change from state science standards. A Virginia legislator worries teachers are indoctrinating students with their personal views on global warming. And an Oklahoma state senator wants educators to be able to introduce alternative viewpoints without fear of losing their jobs.As climate change becomes a hotter topic in American classrooms, politicians around the country are pushing back against the near-universal scientific consensus that global warming is real, dire and man-made. Of the more than a dozen such measures proposed so far this year, some already have failed..."
Senate Showdown Over Green New Deal: Links and headlines courtesy of Climate Nexus: "Senate Democrats sparred with Republicans on the floor Wednesday over the Green New Deal, interrogating GOP lawmakers bashing the proposal over their plans to combat climate change. "Maybe a lot of members think they can get away without having to answer the question [about what to do about climate change]," Minority Leader Chuck Schumer told collected lawmakers. "They won’t." Majority Leader McConnell said earlier this week that he plans to bring a vote on the Green New Deal over the next few weeks, and some leading Democrats told Politico that they plan to vote "present" on the politically tricky legislation while taking Republicans to task on their climate denial. "This is the first time Democrats have decided to go on offense on climate change," Schumer told the New York Times in an interview earlier this week, but added that "it’s going to take us a little while to come up with a consensus that works." (Politico, ABC, Bloomberg, New York Times $. Commentary: NYT The Daily, Vox, Dave Roberts column).